On first glance, Mecysmaucheniidae spiders, which live exclusively in New Zealand and southern regions of South America, do not look like much to the naked eye. Because they are minute spiders that hunt for prey on the ground, they are hard to spot, even with keen, trained eyes. But now, a team of researchers led by Smithsonian scientist Hannah Wood has discovered that these spiders are more remarkable than they look, with a surprising ability to strike their prey at lightning speed and with super-spider power, according to new findings reported in the scholarly journal Current Biology. Using DNA analysis, Wood and the team found that the high-speed, power-amplified strikes have independently evolved at least four different times—a phenomena known as convergent evolution—within the Mecysmaucheniid family. 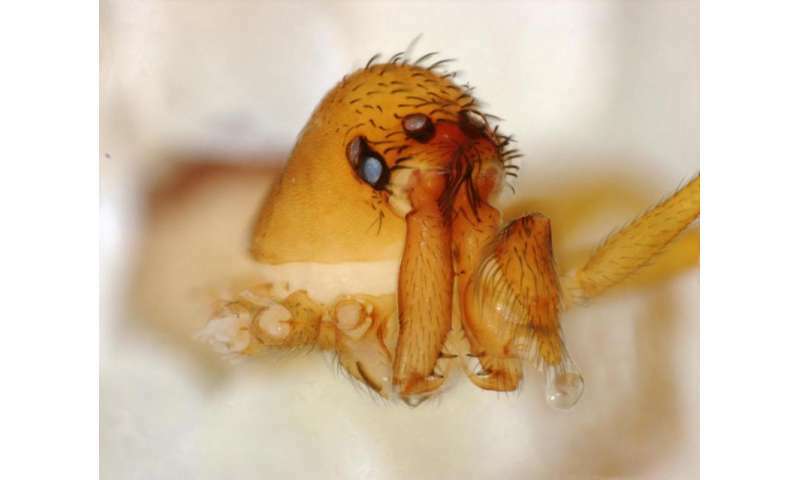 The findings also contribute to Wood's broader investigation into the evolution of the spider tree of life, shedding new light on how the bizarre "head" anatomy of trap-jaw spiders and their relatives may have allowed them to evolve unique survival abilities like power-amplified strikes. "This research shows how little we know about spiders and how much there is still to discover," said Wood, curator of spiders at the Smithsonian's National Museum of Natural History. "The high-speed predatory attacks of these spiders were previously unknown. Many of the species I have been working with are also unknown to the scientific community. Scientists who are curious about natural history discover new things because they focus on understudied organisms rather than well-known model organisms. These new findings then begin filling in a puzzle, revealing epic stories about evolution across the tree of life." While in Madagascar in 2005, Wood was captivated by pelican spiders, a related but separate group from trap-jaw spiders. Pelican spiders have unusual, highly maneuverable jaw-like mouth parts scientifically known as chelicerae. They stalk other spiders and attack from a distance by reaching out with their long chelicerae, stabbing their prey with fangs located at the tips. Wood hypothesizes that the orientation of the muscles in the pelican spider's elongated "head" allows them to make these unusual movements with their chelicerae. Wood began to examine a close relative to the pelican spiders, the trap-jaw spiders, which had similarly modified "heads." 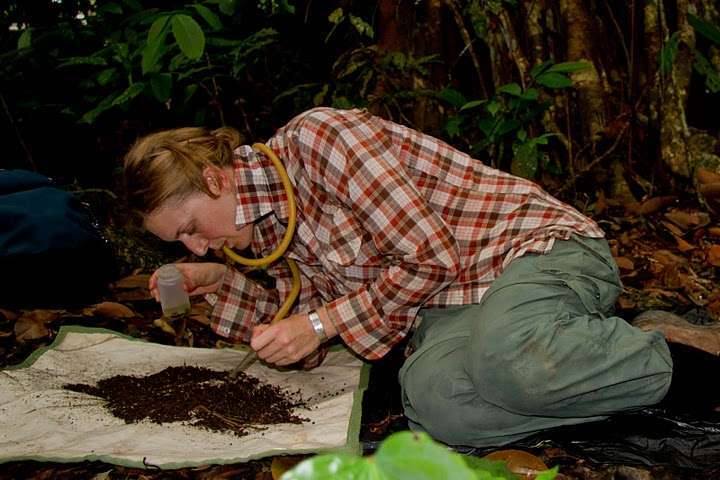 She investigated how trap-jaw spiders in Chile were using their unusual "head" anatomy and observed that they would stalk their prey with their chelicerae wide open, snapping them shut once their prey was close enough, similar to a mouse-trap. She recorded different species of trap-jaw spiders with the hunch that trap-jaw spiders might be using their specialized "head" anatomy to snap their chelicerae shut at extremely fast speeds. Wood used a high-speed camera to record the spiders—some species had to be recorded up to 40,000 frames a second. These videos showed that when target prey came close enough, the spiders snapped their chelicerae shut with incredible power and speed. That kind of predatory behavior had been observed before in the distantly related group of ants, but not in arachnids, the branch on the tree of life that includes spiders. High-speed videos of 14 species of Mecysmaucheniid spiders revealed a great range of mouth-part closing speeds. The fastest species of trap-jaw spider snaps its mouth-parts shut more than 100 times faster than the slowest species. Aside from sheer speed, the power output from four of the spider species exceeded the known power output of their muscles, the researchers found. This finding implies that the spiders' movements cannot be directly powered by the spiders' tiny muscles. Instead, other structural mechanisms must have evolved that allow trap-jaw spiders to store energy required to produce their high-powered, lightning-quick movements. 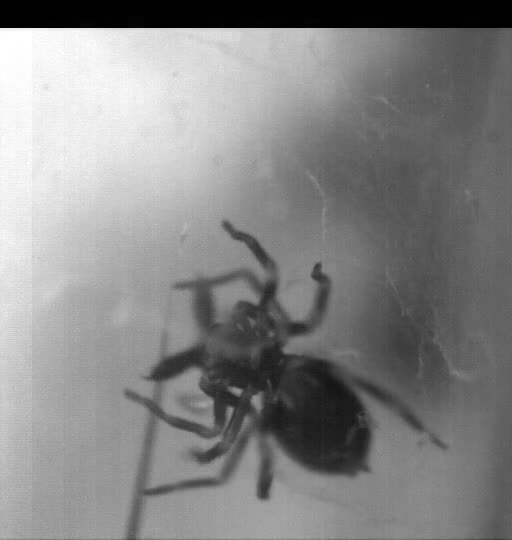 The biological ability of these spiders' to release stored energy almost instantaneously results in power being amplified. Wood and the researchers describe some of the anatomical differences between the power-amplified trap-jaw spiders and their close relatives. The research team is conducting additional investigations to better understand the underlying mechanism for storing energy for trap-jaw spiders' power-amplified behavior, learn why these spiders originally evolved this behavior and discover what these spiders prey upon in the wild. In addition to providing new insights into spiders and their evolution, the new findings may have broader implications beyond the field of natural history science. "Many of our greatest innovations take their inspiration from nature," Wood said. "Studying these spiders may give us clues that allow us to design tools or robots that move in novel ways."